No.70000 Britannia has been undergoing overhaul at LNWR Crewe for a while. Many enthusiasts are and were hoping to see both preserved Britannias together before No.70013 'Oliver Cromwell' gets taken out of service. This still may be a possibilty but a small one. 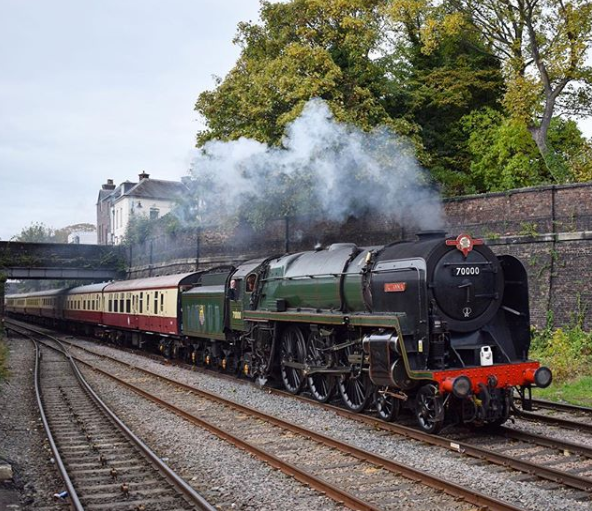 Britannia came out of overhaul earlier this year and went to the Severn Valley Railway for testing / Running in. Recently She left the preserved railway for the mainline. She went from Kidderminster (SVR) to Crewe H.S. She is currently undergoing mainline testing and crew training. It is most likely she will be hauling charters for Saphos Trains (Icons of Steam Charter Company). 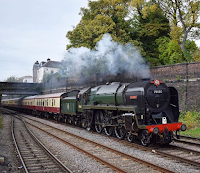 She will be joining Royal Scot, Lord Dowding and a few others at Saphos Trains.